Mars orbiters, rovers and landers have all captured devils in action before. But this latest shot is a whopper (to speak in the vernacular of the peasantry…*) – not to mention incredibly awesome! The HiRISE camera (High Resolution Imaging Science Experiment) on the Mars Reconnaissance Orbiter has taken an image of an afternoon whirlwind on Mars lofting a twisting column of dust more than 800 meters (about a half a mile) high, with the dust plume about 30 meters or yards in diameter. HiRISE captured the image on Feb. 16, 2012, in the Amazonis Planitia region of northern Mars. 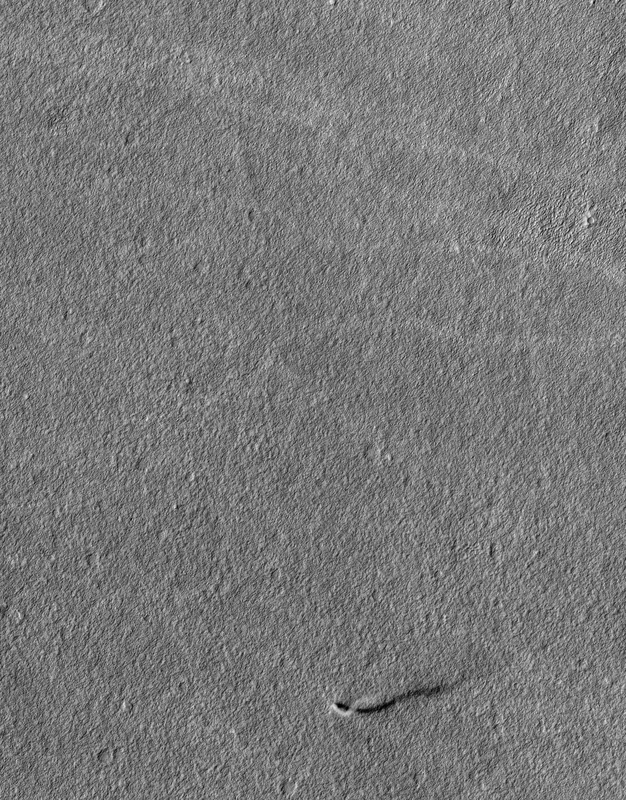 Evidence of many previous whirlwinds, or dust devils, are visible as streaks on the dusty surface shown in the image. Scientists from JPL said the active dust devil and its delicate arc were produced by a westerly breeze partway up its height. Just like on Earth, winds on Mars are powered by solar heating. However, Mars is now farthest from the Sun, and even though the exposure to the Sun’s rays is now less, even so, the dust devils are moving dust around on Mars’ surface. MRO and HiRISE continue to provide insights into the planet’s ancient environments and how processes such as wind, meteorite impacts and seasonal frosts continue to affect the Martian surface today. This mission – operating since 2006 in Mars orbit – has returned more data about Mars than all other orbital and surface missions combined. See more images on the HiRISE website. *A free subscription to Universe Today for anyone who can name where that quote is from. Rewrite.. Please! Too many errors to point them out. Ivan3man, where are you? On the other hand, really cool picture! Looks like a Martian campfire. I think that quote is from the Wizard of Oz? Maybe. Why is its shadow a different shape to itself please? We don’t see the entire shadow in this image. The part of the shadow we do see is from the lower half of the dust devil. petr, Tony N is correct, in fact the trigonometric distances can be used to compute the height of the various features of that dust devil column. The local azimuth can also be told — if this is a cropping, and if the original photo is large enough, it is possible to gain additional information. I don’t think that it’s a shadow, but the trail left by the Dust Devil itself. If that were true, then it raises a lot of questions. Why is the trail so dark? And where is the shadow if that’s not it? The simpler explanation is that it’s the shadow. I stand corrected! I didn’t realised they left trails. That said, I still suspect the apparent trail in the image is actually the shadow. http://hirise.lpl.arizona.edu/images/2012/details/cut/ESP_026051_2160-1.jpg is the full size image. Hirise website states trails in this area of Mars are lighter because there is a thick layer of dust above the darker bedrock, and this dust layer resists the scouring of the dust devil. Outstanding image! I love dust devils. I organize dust devil chases in the Summer in nearby fields, and did a little bit of research on them as an undergraduate research project several years ago.